We are living in Twitter and Instagram age where having no access to internet on your device is really frustrating. Internet has become important in our daily life. We use it to buy things online, do our study research, for entertainment and to share the important moments of our life with friends and family. Have you altered the APN settings? Sometimes it happens you or kids may have accidentally changed the settings and you won’t have access to 3G/4G LTE data on your device. It’s not a big issue and can be easily fixed. There is also an easy way but that might take sometime. Call your network support agent and they’ll send you the configurations in SMS. Then you can easily save them with just a tap. If support agent was unable to send you the config file, then you’ll have to manually set it up. Below you’ll find APN settings for all major US Cellular networks including T-Mobile, AT&T, Verizon, Sprint, US-Cellular, Virgin, and Boost Mobile. Now all you need to do is find your network and enter the APN credentials for your respective network. Step 1: First of, Go to phone settings. Step 2: Under the Wireless and networks, tap More settings. Step 3: On the next screen, select Mobile networks. Step 4: Tap Access Point Names. 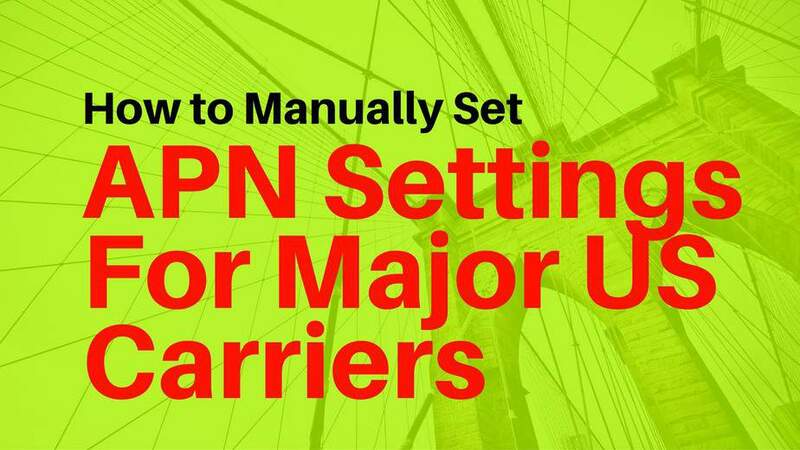 Step 5: Tap New APN and add the configuration settings provided by the network. Step 6: Finally tap the menu key to save. That’s it guys, this is how we set the APN manually on Android. If you still have any questions, do let me know in the comment section for further support.